[BILL OF RIGHTS]. Newspaper. 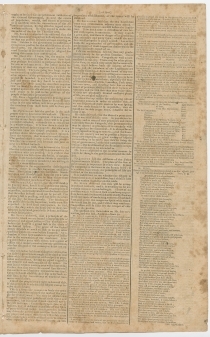 Gazette of the United States, August 29, 1789. New York: John Fenno. Includes a complete printing of the first House of Representatives proposal for amending the Constitution on page 2. 4 pp., 10 x 15¾ in. The lack of a Bill of Rights, a central feature of most state Constitutions, was a principal criticism of the recently-drafted federal Constitution. During the Constitutional Convention some delegates opposed its inclusion, thinking it unnecessary or afraid that the act of enumerating specific rights would imply that those not listed did not exist. On the other side, Anti-Federalists wary of new federal powers were among the most ardent proponents of a Bill of Rights. Ultimately, to ensure ratification of the Constitution, the Convention delegates promised that Congress would address guarantees of specific liberties in their first session. During the ratification process, five states that approved the Constitution passed along lists of proposed amendments, while two states, Rhode Island and North Carolina, that had refused to ratify also suggested amendments. In all, nearly one hundred discrete amendments were offered. James Madison, the “father of the Constitution,” was at first lukewarm to the idea of a Bill of Rights. However, during his first Congressional campaign against James Monroe, he promised to fight for such a measure. Among Madison’s fears were threats by Anti-Federalists, even after the Constitution had been ratified, of calling another convention, which would have likely been much less harmonious. On May 4, 1789, Madison told the House of Representatives that he planned to present a slate of amendments in three weeks. When May 25 arrived, the Congressmen were locked in a debate over import duties. Madison demurred until June 8, when the House again rebuked his efforts, citing more pressing business. Rising once more, Madison justified his timing, apologized to his colleagues, and proceeded to introduce his proposed amendments. On July 21, 1789, the House formed the Committee of Eleven (a member from each state) to consider the proposed Amendments. The Committee reported on July 28, taking the nine broad areas Madison had suggested for amendment and drafting 17 individual amendments for House approval. These passed the House on August 24, and the Senate began their debate the next day. The Senate initially reduced the House’s proposed 17 amendments to 12, and then passed its own version on September 9. The bill then went back to the House for reconciliation. The House reconciled the two bills on September 24, and the Senate issued its final approval the next day. The twelve articles of amendment were sent to the states for ratification on October 2, 1789. Two of the twelve proposed amendments, the first regarding apportionment of representation in the House and the second, congressional salaries, were not ratified by the states. However, article #2, which stated that Congressional pay increases (or decreases) would not take effect until an election had ensued, eventually became the 27th Amendment on May 8, 1992, 203 years after it was first proposed. Articles 3 through 12 became the 1st through 10th Amendments of the federal Constitution upon Virginia’s ratification on December 15, 1791. 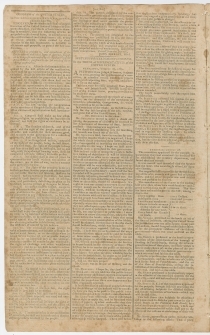 RESOLVED, by the Senate and House of Representatives of the United States of America in Congress assembled, two thirds of both houses deeming it necessary, that the following articles be proposed to the legislatures of the several states, as amendments to the constitution of the United States, all, or any of which articles, when ratified by three fourths of the said legislatures, to be valid, to all intents and purposes, as part of the said constitution. ARTICLES in addition to, and amendment of the Constitution of the United States of America, proposed by Congress, and ratified by the legislatures of the several States, pursuant to the 5th article of the original constitution. ARTICLE 1. After the first enumeration required by the first article of the constitution, there shall be one representative for every thirty thousand, until the number shall amount to one hundred, after which the proportion shall be so regulated by Congress, that there shall be not less than one hundred representatives, nor less than one representative for every forty thousand persons, until the number of representatives shall amount to two hundred, after which the proportion shall be so regulated by Congress that there shall not be less than two hundred representatives, nor more than one representative for every fifty thousand persons. ART. 4. The freedom of speech, and of the press, and the right of the people peaceably to assemble, and consult for their common good, and to apply to the government for a redress of grievances, shall not be infringed. ART. 6. No soldier shall in time of peace be quartered in any house without the consent of the owner, nor in time of war, but in a manner to be prescribed by law. ART. 7. The right of the people to be secure in their persons, houses, papers, and effects against unreasonable searches and seizures, shall not be violated; and no warrants shall issue, but upon probable cause supported by oath or affirmation, and particularly describing the place to be searched, and the persons or things to be seized. ART. 8. No person shall be subject, except in a case of impeachment, to more than one trial or one punishment for the same offence, nor shall be compelled in any criminal case, to be a witness against himself, nor be deprived of life or liberty or property, without due process of law, nor shall private property be taken for public use without just compensation. ART. 9. In all criminal prosecutions, the accused shall enjoy the right to a speedy and public trial, to be informed of the nature and the cause of the accusation, to be confronted by witnesses in his favor, and to have the assistance of counsel for his defence. ART. 10. The trial of all crimes (except in cases of impeachment, and in cases arising in the land or naval forces, or in the militia when in actual service in time of war or public danger) shall be an impartial jury of the vicinage, with the requisite of unanimity for conviction; the right of challenging and other accustomed requisites; and no person shall be held to answer for a capital or otherwise infamous crime, unless on a presentment or indictment by a grand jury; but if a crime by committed in a place in the possession of an enemy, or in which an insurection may prevail, the indictment and trial may by law be authorised in some other place within the same state. ART. 11. No appeal to the Supreme Court of the United States shall be allowed, where the value in controversy shall not amount to one thousand dollars; nor shall any fact triable by a jury according to the course of the common law, be otherwise re-examinable, than according to the rules of common law. ART. 12. In suits of common law, the right of trial by jury shall be preserved. ART. 15. The enumeration in the Constitution of certain rights, shall not be construed to deny or disparage others retained by the people. ART. 16. The powers delegated by the constitution to the government of the United States shall be exercised as therein appropriated, so that the legislative shall never exercise the powers vested in the executive or judicial; nor the executive the powers vested in the legislative or judicial; nor the judicial the powers vested in the legislative or executive. ART. 17. The powers not delegated by the constitution nor prohibited by it to the states, are reserved to the states respectively. 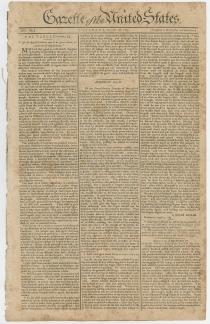 This newspaper also prints “The Tablet” (p1/c1-2); an essay on processing sugar from maple trees, by “A Sugar Boiler” (p1/c2-3); proceedings of Congress on the location of the national capital, the safeguarding of official records and the great seal, and the establishment of the treasury department (p2/c2-p3/c3); a humorous poem on the scramble for the national capital (p3/c3); a continuation of “The Right Constitution of a Commonwealth Examined” (p4/c1-2); a continuation of “An Essay on Free Trade and Finances” (p4/c2-3); An Act to Provide for the Government of the Territory North-West of the River Ohio and An Act providing for Expences which may attend Negotiations or Treaties with the Indian Tribes, and the appointment of Commissioners for managing the same, both signed in type by George Washington and John Adams (p4/c3); and another installment of “The National Monitor” (p4/c3). “The Tablet” appeared in the Gazette in every issue from the first, April 15, 1789, into August 1790, and then periodically to No. 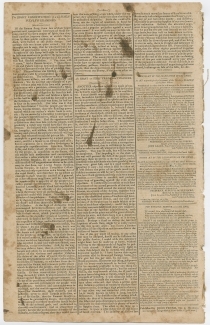 155 in the April 9, 1791 issue. The first number announced its purpose “to touch upon such subjects as are calculated to afford amusement or instruction, without disturbing society with calumny and petulance.” Anonymous contributors included publisher John Fenno and lexicographer Noah Webster (1758-1843), who shared a common political nationalism. “The Right Constitution of a Commonwealth Examined” was written by Vice President John Adams (1735-1826). The first three-quarters of it appeared serially in the Gazette between May 23 and November 4, 1789. Adams particularly criticized the republican theories of Marchamont Nedham (1620-1678), a pamphleteer during the English Civil War. “An Essay on Free Trade and Finances” appeared serially in the Gazette between June 3 and October 21, 1789. The author was Pelatiah Webster (1726-1795), an ordained Congregationalist minister and Philadelphia merchant. 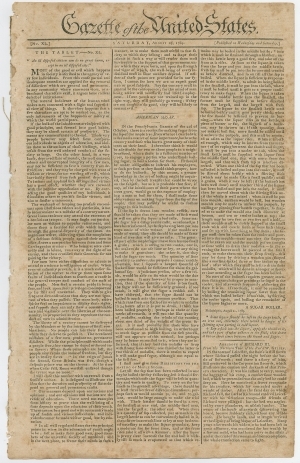 The essay was first published in Philadelphia on March 24, 1783. T. Bradford’s bookstore in Philadelphia sold it in pamphlet form as early as April 1783. It was the sixth of seven essays Webster wrote on Free Trade and Finance between 1779 and 1785. “The National Monitor” appeared in thirty-four numbers from April 25, 1789, and January 20, 1790.